Theres a well dressed woman on a Huddersfield High Street, July 1908, hand-selling the progressive paper Votes For Women. Shes approached by the sort of angry, flushed-faced battle axe youd expect from Sir John Tenniel. What? Dont you like the truth? This is nothing short of a masterpiece: a most affecting piece of personalised fiction so steeped in British social history  at specific times, in specific places  that I was under the constant illusion of reading a biography. 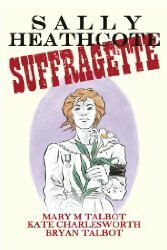 Most of the individuals surrounding Sally Heathcote were very real, well documented campaigners for womens suffrage and wider rights, while all the events so meticulously researched here actually happened. Moreover it is primed with a punchline which, when detonated after so much assiduously laid groundwork of sacrifice and suffering, will ring in your ears for years. From the creative team behind the 2012 Costa Book Award winner for best biography, DOTTER OF HER FATHERS EYES, with the addition of Kate Charlesworths period pencils and washes so soft until a staggering level of violence erupts catastrophically across the page, it is another arresting reminder from Dr. Mary Talbot of things that must never be taken for granted and should never be forgotten. It seems barely conceivable now that women were ever denied the right to vote: on average that would mean half your friends and relatives and potentially yourself. The word is absurd. What this graphic novel impresses upon one above all is both the sheer teeth-gritting tenacity of these determined individuals in pursuit of nothing more than basic humanity which we call equality, and the dissemblance, the callousness and the viciousness they were met with by a dogmatic establishment determined to hoard power for themselves, plus the obstruction and resentment they faced from their peers who jeered at them in the street. The threat of personal assault was constant, its level prohibitively intimidating to most. Sally Heathcote is caught in the middle and swept up in the moment. 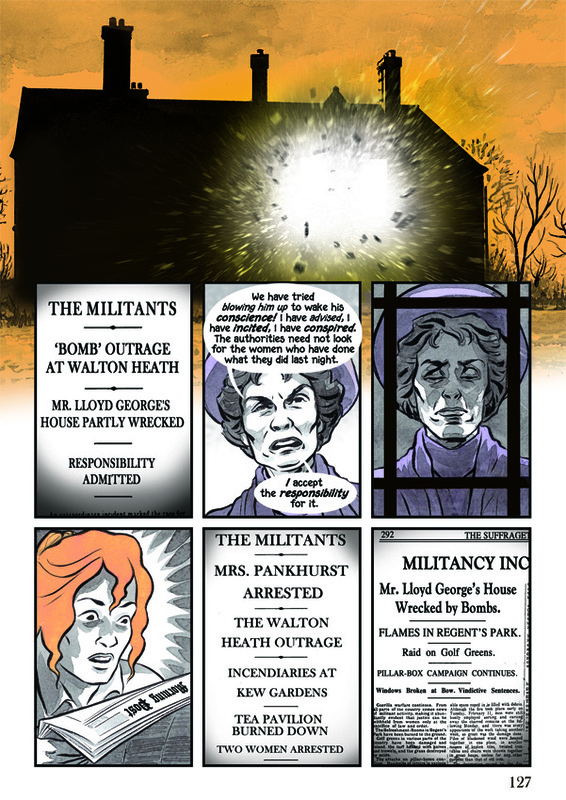 It is in 1912, during this first moment of most extreme schism, that Sallys recollections begin. Fred and Emmeline Pethick-Lawrence are returning to Britain. Old-school philanthropists, it was they who originally launched the newspaper Votes For Women and who, as loyal supporters and bankrollers of The Womens Social and Political Union, have been so badly hit by the government for compensation for that evening of extensive property damage that they nearly lost their house. And it is at this, their most vulnerable hour, that Mrs. Pankhurst severs her ties with the couple (as she would later her own daughter Sylvia) by expelling them for the W.S.P.U.. Which is nice. 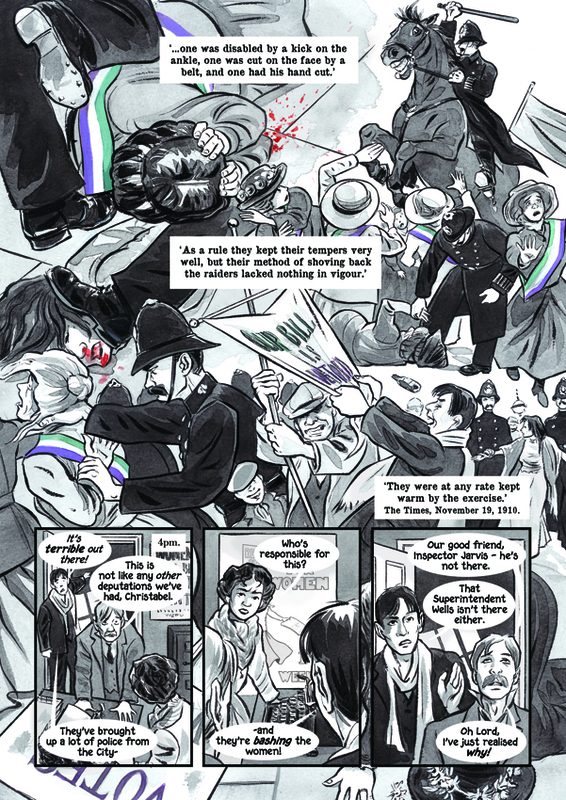 But we are fewer than a dozen pages into the graphic novel before being pulled back even further to Spring 1898 when Sally, a pauper-prisoner of the workhouse, is first taken in by a younger, gentler Mrs. Pankhurst who employs her as a maid-of-all-work while aiding her seamstress skills. 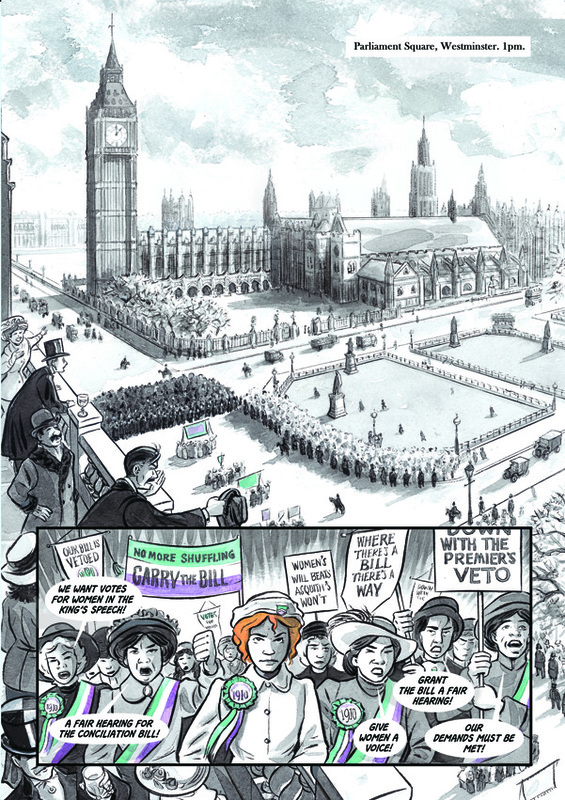 She is treated well and, while waiting on the family in Manchester, is privy to many a conversation on the current campaigns of Mrs. Pankhurst, her daughters, and their fellow activists. Unless provoked by the crowds they are relatively peaceful. The arrests and hunger strikes, brutal force-feedings and governmental cat-and-mouse games have yet to begin. Reason will win the day, surely. 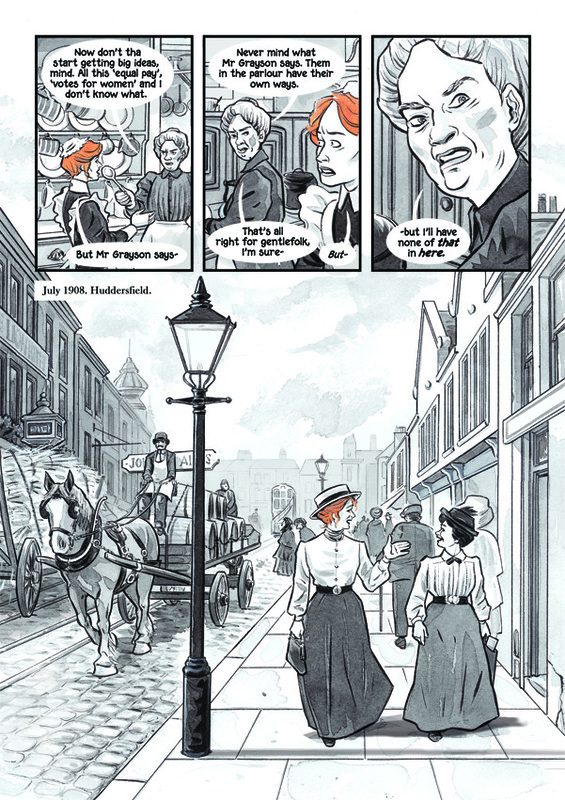 But when Mrs. Pankhurst is lured down to London by the early successes of her more interventionist actions Sally is cast aside and is referred instead as a domestic servant to a Huddersfield household which is much less enlightened both upstairs and downstairs. It is a very rude awakening. Off her own bat she attends joyous, regional rallies  for the womens movement is far less centralised as yet  but this lands her in even more trouble with the men of the house. 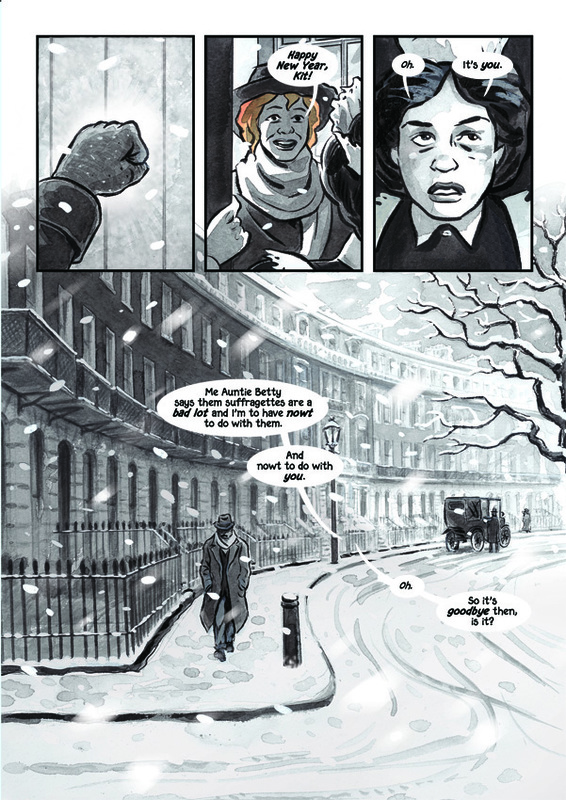 So it is that Sally Heathcote too finds herself drawn to London and, through curiosity and the kindness of strangers, finds herself at the doorstep of the Pethick-Lawrences and back on the Pankhursts radar. Her journey has only begun. 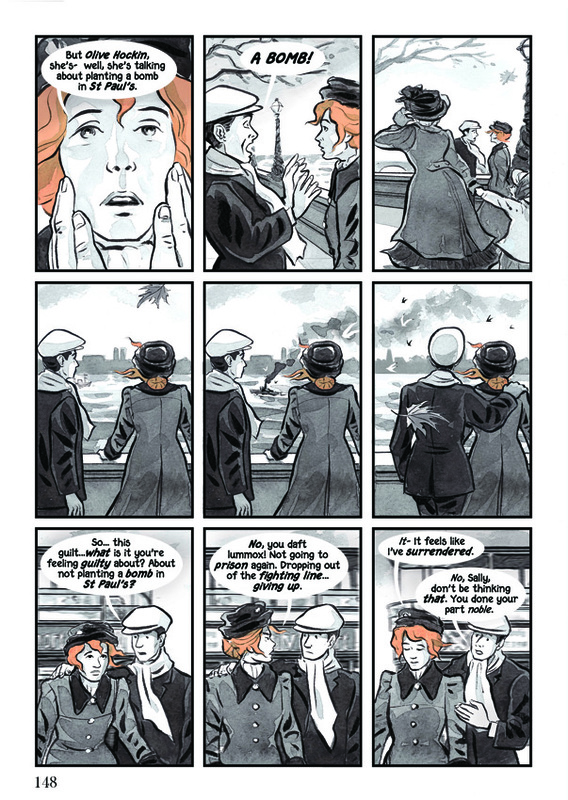 Rarely have I found myself leafing through a graphic novel on first, cursory inspection and found myself absorbed in such an attractive or consistent atmosphere. 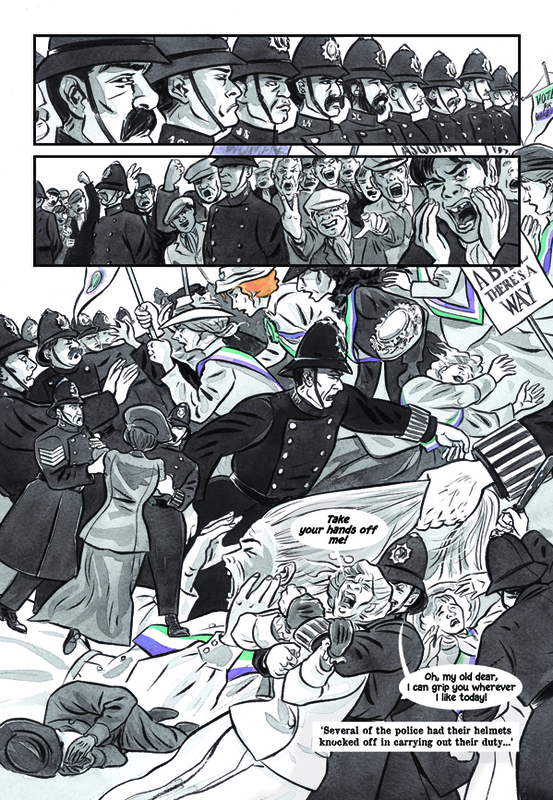 As you would expect from the creator of THE TALE OF ONE BAD RAT, Bryan Talbots layouts are an immaculate essay in clarity, accessibility and restraint, his architectural panoramas quite breath-taking, redolent of their precise time and place. Charlesworths treatment of these is enticing and sumptuous, bursting with humanity. Theres a gentleness in Sally and her future beau Arthur which reflects their vulnerability both as individuals and to the exterior forces which threaten to envelop them. Were not just talking about the suffrage movement, its escalating violence and its backlash: were talking about the game-changing eruption of the first World War. So much of this books success lies in evoking the multiplicity and complexity and contradictory nature of the societal pressures at this pivotal point in history and I am frankly agog at Dr. Mary Talbots inclusion and balance which allows us to ponder, equally bewildered, which stance wed take. Is your Best Boy wearing Khaki? If not dont YOU THINK he should be? If he does not think that you and your country are worth fighting for  do you think he is WORTHY of you? These and so many more contemporary clippings are included by the Talbots at judicious intervals then annotated at the back, but never once did they rip me from the story at hand. Instead they made me feel that I was walking in Sallys shoes and so living this life for myself: battered by headlines over tea and toast before wondering what on earth the day would bring next. I cannot overemphasise how critical the art is to this absorbing atmosphere, predominantly washed in warm antler-greys and so reflecting the period as modern readers perceive it in photographic sepia or newsreel black and white, but with canny colour-coding for Sallys ginger hair and Mrs. Pankhurst in purple. In addition the marches and protests are brought alive with their respective union colours: red, white and green for the National Union Of Womens Suffrage and purple, white and green for the National Womens Social and Political Union. A lush bunch of flowers is given a very rare, multi-coloured array, concealing as it does an axe buried within. Equally startling in its stark and shocking departure is the sequence involving outright terrorism which, I put it to you (I have not consulted with either Talbot nor Kate Charlesworth), is either a deliberate or subconscious throwback to David Lloyds work, appropriately enough, on V FOR VENDETTA. Nothing, however, will prepare you for the grotesque scenes in Holloway Gaol which Sally has read about happening to others in the papers. Nothing we read in the papers can prepare us for anything like that happening to us, but it is now that they happen to Sally. None of this would work half so well if all three members of the creative team hadnt built up our personal, involved relationship with Sally the erstwhile seamstress for page upon succinct page. To some a straight biography, hagiography or historical account would have appeared the natural route to take. And that way I would have sat there, semi-educated, shaking my head dolefully and muttering tut tut. This way I was enraged.